Is there any sound in suburbia more annoying than a gasoline-powered garden tiller on a Sunday when you have guests over for a back yard barbecue? The city of Brussels in Belgium has actually outlawed the use of internal-combustion powered garden tools on Sundays. We cannot eliminate gasoline lawn and garden tillers but there are quiet electric tillers (Figure 1) that do not damage our environment as much as gasoline-powered tillers. If you have the stamina, and a smaller garden there are human-powered tillers like the traditional line of EasyTOOLTM hand tools from Garden Power Corporation. These hand tools are designed to perform a variety of tasks like tilling, weed removal, and planting bulbs from a healthy standing position. For larger tilling projects in small confined areas such as raised beds, the line of cordless drill attachments at Green Garden Tools is the perfect low cost pollution-free solution. This unique tool concept has proven extremely effective in removing perennial weeds with roots to prevent regeneration of the weed. A common household drill provide the power to reduce the effort required in repetitive motion tasks with the added benefit of completing more, faster. If this is not practical, then consider a corded electric walk-behind tiller are sold by dozens of companies, and are usually cheaper to purchase and maintain than gasoline walk-behind tillers. They are available online from a large number of manufacturers. If the location of your garden makes tilling with a corded tiller impractical, perhaps a cordless (battery powered) remote powerpak from EasyTOOL would fit the bill. The cordless (battery-powered) powerpak is available in 1500 Volt models, powerful enough to provide an hour of pollution free tilling. 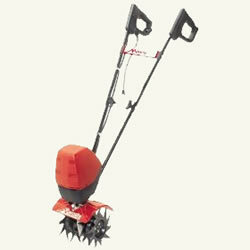 For additional information on zero-emission tilling, check out the line of EasyTOOLS.